The Seattle Mariners are down to their final six games of the season – and they will have a huge impact on the American League wild card race. Going in to Friday, Oakland holds the second and final wild card spot, maintaining a two-game lead over both the Los Angeles Angels and the Tampa Bay Rays. The Mariners final six games are: three games at Oakland, and three home games against the Angels. What if the Mariners take two or even sweep Oakland? That would give the Angels a lot of hope going into the final series – and then the Mariners could put the Halos away at Safeco. Perhaps the Mariners will go 2-1 at Oakland, and then drop two of three to the Angels – then where are we? Seattle just played the Angels very tough in Anaheim, losing a pair of one-run games (including a heartbreaker on Wednesday) before notching a blowout victory last night. Manager Eric Wedge talks a lot about his young team getting experience in key situations, and this final segment of the season certainly qualifies as a crucial stretch – even though little is on the line for the Mariners themselves. They have an opportunity to make things very tough on the contending teams. In Larry LaRue’s story on last night’s Mariners win, he has some key quotes from the Mariners on how they are viewing the upcoming schedule. Mariners ace Felix Hernandez will make his final start of the season on Monday against the Angels – but it could be a short one. In that notebook: several Mariners could be playing in the World Baseball Classic this winter, most notably Felix for Venezuela and Michael Saunders for Team Canada. Larry Stone has been won over: he says to give Justin Smoak one more chance in 2013. This will be the debate of the Mariners off-season. Jason Churchill noticed some of the changes that Smoak has made with his swing. According to Baseball America, the Mariners had two of the top three prospects in the Northwest League this year – and four of the Top-20. Congratulations to Tacoma’s Director of Ballpark Operations Ryan Schutt, who was recognized as one of Esquire magazine’s Employees Of The Month. Two former Rainiers pitchers had big days yesterday: R.A. Dickey became the first knuckleballer to win 20 games in a season since Joe Niekro in 1980, and Doug Fister set the American League record by striking out nine batters in a row. One of the legends of my craft called his final game Wednesday night: Milo Hamilton, the voice of the Houston Astros, is hanging up his microphone at age 85. This is a must-read story, from Tony DeFrancesco‘s reaction to the managers he has worked with, to the note that Milo still uses the brief case that the Chicago White Sox gave him… in 1961. It should be noted that both of Milo’s broadcast partners in Houston worked recently in the PCL. Brett Dolan was the lead radio announcer for the Tucson Sidewinders, and Dave Raymond worked in the Iowa Cubs booth with Deene Ehlis. According to the mysterious people who run the @RainiersLand twitter account, today is “National Sibling Day.” This caused them to publish on twitter a great shot of Clay Huntington interviewing all three Alou brothers at Cheney Stadium. I don’t know what the heck “National Sibling Day” is, but if it spurred the Rainiers to dig out this gem from the photo archives, well, I’m all for it. It’s an awesome photo, I thought it would be fun to CSI it a little bit. That’s definitely Cheney Stadium – the right field light tower, shipped to Tacoma after they tore down Seals Stadium in San Francisco, has been in place at Cheney since 1960. It even survived the remodel. You can see the then-undeveloped Foss tennis courts hill in the background. On the left, we have Felipe and Matty Alou in their San Francisco Giants uniforms. On the right, Jesus Alou is in his Tacoma Giants uniform. In the middle, we have Mr. Huntington in a snappy sports coat adorned with a Tacoma Giants lapel badge. Felipe Alou – who would become a great manager – never played in a game as a member of the Tacoma Giants. But the San Francisco Giants used to play an annual exhibition game at Cheney Stadium against the Tacoma affiliate, and this picture is clearly from one of those exhibitions. (These exhibitions are the reason why some older fans remember seeing Willie Mays play in Tacoma. Mays played in several of these exhibitions between 1960 and 1965). 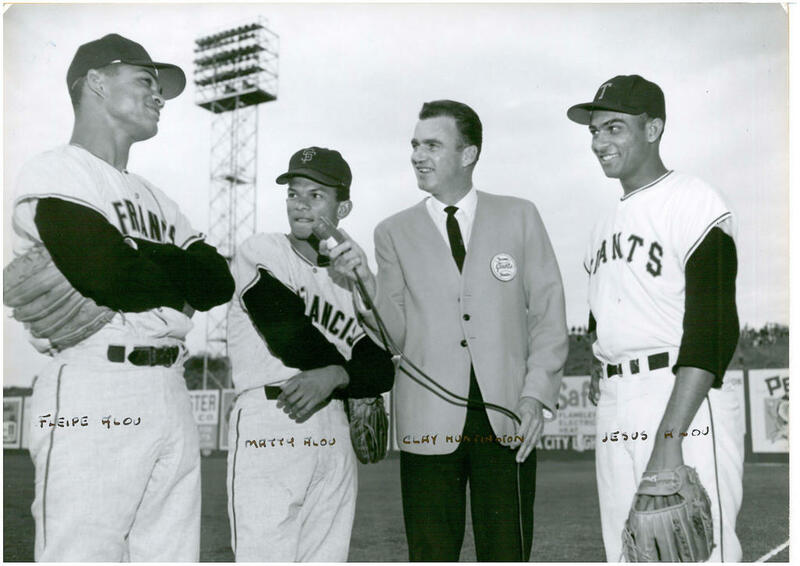 Matty Alou was one of the stars of the inaugural 1960 Tacoma Giants, hitting .306 while playing in 150 games. Matty cracked the San Francisco opening day roster in 1961 as a reserve outfielder – but he couldn’t break into the starting outfield of Mays, Willie McCovey, and his brother Felipe. Matty was a back-up outfielder in 1961 and 1962, and in 1963 his playing time really deteriorated so he was sent back to Tacoma for a month to get some at-bats. Eventually he was traded to Pittsburgh where he became a starter and won a batting title. The appearance of Jesus Alou in a Tacoma uniform makes this CSI an easy project: Jesus only played for Tacoma for one season, in 1963. Jesus had one of the best full-seasons in Tacoma’s long franchise history, batting .324 over 648 at-bats in 1963 – a batting average that still ranks as Tacoma’s 11th-highest single-season mark. He played in 158 games, a Tacoma single-season record that may last forever, since the PCL only plays 144 now. It appears this photo was taken prior to a San Francisco Giants vs. Tacoma Giants exhibition game in 1963. It must have occurred during a portion of the season when Matty was up with the big club. Jesus got called up in September of 1963 and three times that September the San Francisco Giants fielded an all-Alou outfield – although, as the New York Times mythbusted, they never did all start the same game. Larry LaRue has a story in The News Tribune about how the Mariners are better than they were last year. I agree with the sentiment: the team is improved from one year ago, even if it doesn’t really show in the won-loss record. They are much more fun to watch. In the Times, Geoff Baker has an excellent article on the remarkable turnaround of Mariners reliever Oliver Perez. Perez signed as a minor league free agent and opened the season in Tacoma. Justin Smoak hit a pair of home runs last night in the Mariners 5-4 loss at Anaheim. Smoak is on yet another September tear… hey, I think I figured out what to do with him! Here’s the plan: we keep him in Tacoma all season, while the Mariners contend for a wild card in the majors, and then when the roster expands they make the call – and here comes September Smoak, ready to blast the Mariners into the post-season! Who’s with me? So you want to operate a Class-A team in the middle of nowhere? The Mariners High Desert affiliate is hiring a general manager. Something good has come from the NFL referees lockout: it reminded Larry Stone to write about the 1979 umpire’s strike. Great stuff here. Congrats to former Rainiers outfielder Michael Saunders, as he and his wife Jessica had a baby. Prospect analyst John Sickels tried to make something of Danny Hultzen‘s season. His conclusion: don’t panic. Yet another step towards El Paso: the ownership group signed an agreement to purchase the Tucson Padres. Some excellent pennant races going into the final week of the season. Maybe the Mariners can be a factor and help bury the Angels? The Mariners had a very good weekend, taking two of three from first-place Texas. The Mariners finished the season series with a 9-10 record against the top team in the division. It may not seem like much, but it is definitely an improvement. Larry Stone’s Sunday baseball package in the Seattle Times included a column on the Melky Cabrera batting title situation, a notebook with a hilarious item on Orioles pitcher Tommy Hunter, power rankings, and a former Rainiers infielder in his thumbs up-and-down. Baseball America ranked the prospects in the Arizona Rookie League, and Mariners teenager Gabriel Guerrero made the list despite not joining the league until late. He is Vladimir Guerrero‘s cousin and he took a big step forward this year after opening the season in the Dominican Summer League and playing his way off the island. On Sunday the Omaha newspaper ran a Storm Chasers season wrap-up. Here’s a fun story from Calgary about the final days of the Calgary Cannons, who played in the PCL from 1985 through 2002. Calgary was always one of the most fun stops in the league – although the weather was quite dramatic, and the ballpark was a Reno-like launching pad. Burns Stadium had the scariest press box ever: you walked up the stadium steps behind home plate to the top row, went through a door and took more steps that were like a fire escape attached to the back of the building with the ground 50 feet below, then emerged once again inside the stadium on a ceiling catwalk to walk to the press box that hung from the underside of the roof of the stadium. The whole press box would shake when there was a gust of wind, and it felt like it was going to fall from the roof and crush a section of fans behind home plate. It was truly terrifying. I had a chance to visit with former Rainiers outfielder Adam Jones on Wednesday at Safeco Field. We talked for a while and I recorded an interview with him – it’s been posted on the Rainiers website, you can hear it right here. A few hours and 11 innings after the interview, Jones cracked his 30th home run of the year to give his Baltimore Orioles a 3-1 victory over the Mariners. It was yet another extra-innings win for Baltimore, who is in the stretch run of a drive to reach the playoffs for the first time since 1997. Adam played in Tacoma in 2006 and 2007. In 2006 – his first Triple-A season – Jones hit .287 with 16 home runs and 62 RBI. He made the PCL All-Star team and represented the Rainiers in the Triple-A All-Star Game Toledo, Ohio before getting his first call-up to the majors. He was only 20 years old that season. Jones returned to Tacoma in 2007 and damaged the Pacific Coast League to the tune of a .314 average with 25 homers and 84 RBI in just 101 games. He had a .967 OPS for Tacoma as a 21-year-old. The Mariners traded Jones – their top prospect – to the Orioles after the 2007 season in a package for starting pitcher Erik Bedard. The Mariners had just won 88 games and they thought the addition of Bedard would push them to the top of the standings. At the time of the trade, it was a controversial deal and a hot topic for talk radio and baseball analysts. The Mariners traded their top prospect in an attempt to win now. Personally, I leaned very slightly against the trade at the time. Like all Rainiers fans, I had seen Jones play for two seasons and I knew he was going to be a good major leaguer. But I understood that the Mariners saw a window to reach the playoffs, and you have to give up something good to get something good. With the benefit of perfect hindsight, we now know that trade was a disaster. In the interview, he talks about the trade and brings up an interesting comparison to Detroit Tigers center fielder Austin Jackson, who was traded at the exact same moment in his career, in a very similar deal. Oh yeah, one other thing: after the interview, I asked Adam how his mom is doing. Many Rainiers fans remember her from Cheney Stadium for her gregarious personality. He said Andrea is doing great and is well-known in Baltimore, too. 0:00 to 1:00 – a few general thoughts on the Orioles success this year. 1:00 to 2:15 – getting traded to the Orioles and the opportunity that resulted from it. 2:15 to 3:45 – on signing a long-term contract with the Orioles and suddenly becoming extremely wealthy. 3:45 to 5:20: – on social media and interacting with fans on twitter (follow Adam @SimplyAJ10). 5:20 to 6:43 – on teammates in Tacoma who helped him become a big leaguer. “No problemo.” I hope you like it. It looks like the PCL’s Tucson Padres will be moving to El Paso, TX for the 2014 season after some final hurdles were cleared. This will cause a realignment of the divisions after the 2013 season. The News Tribune has an article on Michael Saunders and his successful season. The Seattle Times has a feature on Justin Smoak and trying to overcome a rough season. Ichiro has recently been on a tear for the Yankees. Memphis Redbirds General Manager Ben Weiss won the PCL Executive Of The Year award. First of all, Reno won the Triple-A Baseball National Championship Game by crushing Pawtucket 10-3 last night in Durham, NC. Reno scored three runs in the first inning and added three more in the second. Soon they were up 8-0 against a PawSox team that looked a little sloppy on the field. Starting pitcher Trevor Bauer did his wild-but-unhittable thing again. He was unable to get through five innings and earn the win, due to walks: he walked seven batters over 4.2 innings, even though he was pitching with a huge lead. The Aces were able to shake off the frustrating start by Bauer and coast to the victory behind their outstanding bullpen. A.J. Pollock was named the game’s MVP, hitting a double and a triple. Pollock was simply staying hot – he was also the MVP of the PC Championship Series. The Aces had home runs from Brent Clevlen and Keon Broxton, and Tyler Bortnick roped a pair of doubles. With that final, the Triple-A baseball season has come to a close. I got to watch the first two hours of the Triple-A game on television, and it was an excellent telecast. Kudos to Triple-A Baseball and the NBC Sports Channel for hiring long-time MLB broadcasters George Grande and Jim Kaat to call the game. They were highly prepared and ready for the early blowout; I enjoyed Kaat’s stories about minor league baseball in the 1950s. Grande and Kaat talked long and respectfully about minor league baseball and the “baseball lifers” who work off the field in minor league towns and cities across the nation. Thanks, guys – we appreciate it! Also, the Durham Athletic Park looked fantastic. I have not been there since I called the 1997 California – Carolina League All-Star Game and it looks like they have done a lot of upgrades to the facility. Back then it was one of the finest in Class-A, but they still had to expand it into a Triple-A ballpark. When I got back to Tacoma, it was the middle of the 15th. I kicked my feet up, enjoyed a cold beverage, and watched the final three innings – only to see the Mariners lose in the 18th, 4-2. Tacoma’s most memorable game of the season was an 18-inning game at Cheney Stadium on July 18. Here is my recap of that one. Because of roster shuffling, the following players played in two 18-inning games this season (one in Tacoma, and one in Seattle): Trayvon Robinson, Stephen Pryor, Alex Liddi, Carlos Triunfel, Mike Carp. Also, Luis Jimenez played in Tacoma’s 18-inning game and was on the Mariners bench but did not play last night. Who logged the most innings in the 18-inning games? That would be Trayvon Robinson. He played all 18 in Tacoma, and then the final seven innings last night, for 25 total innings. In an unusual bit of coincidence, Carlos Triunfel entered each 18-inning game in the 12th inning. Alex Liddi watched the most innings in 18-inning games this year. In July, he came off the bench for Tacoma in the top of the 18th, when the Rainiers ran out of pitching and had to make defensive changes to put Scott Savastano on the mound. Liddi played one inning. Last night Liddi struck out as a pinch hitter in the ninth – so he watched the first eight innings, and the last nine. Liddi watched 34 of a possible 36 innings from the bench in these two games! Stories on the Triple-A Baseball National Championship Game from: the Reno newspaper, the Durham newspaper, MiLB.com, and Baseball America. The Reno newspaper also has an entertaining column on the Aces win and the nature of Triple-A baseball. Subscription required, but Baseball Prospectus has a different look at the Triple-A title game. Larry LaRue stayed until the end of the Mariners 18-inning game and filed this blog report. Lost in the length of the game: Erasmo Ramirez pitched extremely well, and the win was absolutely huge for the Orioles. In the PCL, the El Paso city council narrowly passed a bill to continue progress on a new ballpark – but the mayor has 72 hours to veto it. I’m going to the Mariners game tonight. Felix Hernandez is on the mound trying to prevent an Orioles sweep. Also, the Orioles called up super-prospect Dylan Bundy and he could make his MLB debut in relief tonight. Should be a good game! * I briefly considered going straight to Safeco for the extra innings, but I was not properly attired for press box seating. The last game of the minor league season is tonight in Durham, North Carolina. The PCL champion Reno Aces take on the International League champion Pawtucket Red Sox in a one-game, winner-take-all battle to claim supremacy of Triple-A Baseball. The game will be televised live at 4:00 on the NBC Sports Channel (formerly Versus). Also, you can follow along online right here. This is a game that feels like an exhibition when you are at it*: it’s played on a neutral field, in front of fans who don’t have a rooting interest. Because it is just one game and not a series, it is hard to really believe that a true champion is crowned. All of that being said, the teams on the field are trying to win. Reno is taking it seriously: the Aces are trotting top prospect Trevor Bauer out there to make the start, and he’ll be free to work deep into the game if he is throwing well. Pawtucket is starting veteran right-hander Nelson Figueroa, who went 12-5 with a 3.89 ERA as a swing-man for the PawSox this year. The game is played at Durham Athletic Park, one of the jewels of the International League. Look for the “Hit Bull, Win Steak” sign. Bauer has electric stuff and is fun to watch. Pawtucket’s top prospect is young power-hitting outfielder Bryce Brentz. His at-bats against Bauer should be interesting. Remember former Tacoma reliever Josh Fields, who was once a Mariners first round draft pick? He’s on the PawSox. Obviously, I’m rooting for Reno today – and you should, too. Let’s show some PCL pride! There is a preview of the Triple-A Baseball National Championship Game on MiLB.com, and Baseball America has a preview as well. Reno manager Brett Butler clearly wants to win. Trevor Bauer has an unlikely connection to the Durham area due to his time with Team USA. The Mariners got roughed up by Baltimore last night, 10-4. Hector Noesi had an ugly start – any time the newspaper headline includes the word “meatballs” you know it was bad. Mariners reporter Shannon Drayer has a blog post regarding the Mariners 2013 starting rotation. Former Rainiers slugger Bryan LaHair was a mid-season all-star, and now he’s just a pinch-hitter. Rob Neyer stuns us with an amazing bit of baseball trivia. In the PCL, the proposed move of the Tucson franchise to El Paso could hinge on a big city council vote tonight. It’s official: the Las Vegas 51s are the new Triple-A affiliate of the New York Mets. The Toronto Blue Jays linked up with Buffalo. I’ll have a recap of the title game for you on Wednesday or Thursday. Which would you rather have: a Triple-A Baseball National Championship Game trophy, or two Nine Game Mega Series trophies? * Tacoma played in the game in 2010, when it was in Oklahoma City. The radio broadcast is a mess, as the broadcasters for the two teams are required to work together and send their joint broadcast out to both cities – and usually, they have never even met each other until the day of the game. ** in all seriousness, he notes that we would probably have months of advance warning if Rainier were to erupt. It’s not like we’ll get swept away by molten lava in the middle of the third inning or something. Congratulations to the Reno Aces, winners of the 2012 Pacific Coast League championship. The Aces defeated Omaha on Saturday night, 8-2. That gave them the series victory, 3-1. Reno split the two home games and then won two straight on the road to take down the defending PCL champions. Reno has only been in the league since 2009 and this is their first title. Last night’s deciding victory was a one-sided affair. The Aces out-hit Omaha, 15-7. A.J. Pollock and Mike Jacobs each homered in the eighth inning off Omaha relief ace Donnie Joseph to put the game out of reach. Pollock was named MVP of the series. Tyler Kuhn went 4-for-5 and scored three runs, and Jacobs had three RBI for Reno. Starting pitcher Charlie Brewer pitched into the seventh inning and allowed just two runs, striking out eight while earning the win. The Reno bullpen – which improved dramatically as the season wore on – tossed 2.2 scoreless innings. Reno, of course, is a division rival of Tacoma’s. Reno is the first team from the Pacific-North other than Tacoma to win the league championship since Edmonton took the crown in 2002. Congratulations to the entire Aces organization, with a special RG-to-RG congrats to Reno radio guy Ryan Radtke. Reno has one game left to play: the Triple-A Baseball National Championship game, on Tuesday. It’s being played in Durham, North Carolina this year and will be nationally televised. Reno will send Trevor Bauer to the mound against International League champion Pawtucket. Hard-working Rob White wrote two stories: an Aces-related article for the Reno newspaper, and an Omaha-centric story for his own employer. After the game, Kansas City called up a number of Omaha players, including former Rainiers catcher Adam Moore and top starting pitching prospect Jake Odorizzi. Justin Smoak delivered twice late in the game and the Mariners beat the Texas Rangers on Saturday, 8-6. The M’s can win the series on the road with a victory today. Larry Stone’s Sunday baseball package is up at the Times: a column about the low-scoring environment in MLB these days, a notebook leading off with an item on former Mariners prospect Phillippe Aumont, power rankings, and thumbs up-and-down. There will be no new blog on Monday – we’ll be back Tuesday, with a closer look at the Triple-A National Championship Game. You are currently browsing the Booth, Justice and the American Pastime blog archives for September, 2012.